I woke up this morning and found this beautiful bird sitting in my back yard. Considering how cold it was this morning and how close it was to my house, i had to take photos from my bedroom window. It stood approx 3 feet tall and didnt seem to mind my 80lb dog that was in my yard when it landed. 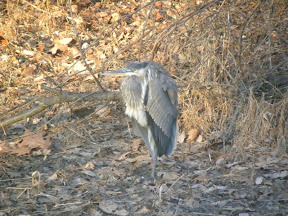 I am not sure exactly what kind of bird it is but suspect it is a Heron. Any information you can share on this bird, i would love to read.